There is the Cartagena that exists for tourists. Then there's the Cartagena that exists for the locals. This is the second kind. Do not enter into this market wearing flashy jewelry or looking richer than the locals. Make sure your feet are properly enclosed in shoes. 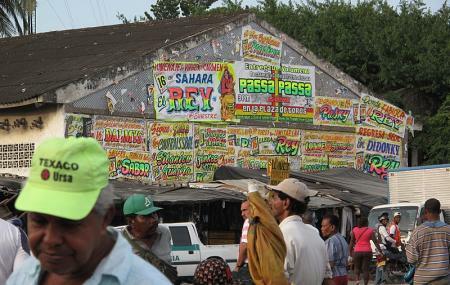 This is a sprawling and labyrinthine maze of vendors and shops selling seafood, fruits, meat and drinks. This is where the chefs of the city descent to get their fresh produce for the day. The food you see here is brought from all over the country. The music you hear here are Colombia’s hottest tracks. It’s vibrant and vital and utterly exotic. It tends to be very crowded so don’t feel overwhelmed if you’re pushed around. Make sure to wear closed shoes. The place has lot to offer, never the less there are no tourists, the streets are very dirty so bring close shoes with you. People are nice, but always count the change after buying something, they keep trying to give less back. Definitely not for every tourist. It is a huge market, filthy, unorganized and with a certain sense of being somewhat dangerous. I didn't feel unsafe but we were followed several times by locals, certainly not very well intended. But it is an adventure, an experience, and I loved it. I certainly recommend it, but only if you feel like you have the guts for it. (you see every part of an animal's body on display there!) The produce there is amazing and you can literally find just about everything that you need, from a to z! It's Colombia and Cartagena at its best, and it's nice to go out of the walled city and live an authentic experience. Also there's loads of food stalls that you can buy and try local food of! Keep your wallet and documents at home (take just some cash in small bills), don't take your expensive camera with you and don't flash your cellphone around, keep your wits about your surroundings there, and you should be fine. It also helps if you know some Spanish. Be sure to have Carolina of Oh La La Restaurant as your guide! Message her to set up a time and then take her cooking class at the restaurant. The experience costs 350,000 pesos and well worth it! Delicious dishes, seeing the market. Best experience wile in Cartagena!